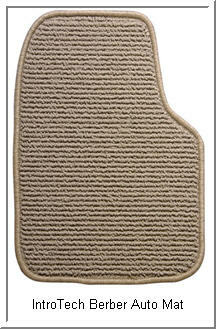 Berber Auto Floor Mats from Intro-Tech Add Class to Your Vehicle. Note: As of 14-Jan-2017 we have observed that IntroTech no longer manufactures these Berber Weave Luxury Car Mats. Rather, Designer Mat International (DMI), a company associated with IntroTech has assumed the manufacturing and distribution of this product. The remaining info on this page is superceded by the new info page for DMI. This page has been retained for historical information purposes only. A nice pair of auto floor mats from Intro-Tech , constructed of a tight pile Berber carpet made of 100% polypropylene yarn, is just what your car needs. You get maximum wear resistance and a Berber carpet is pretty good when you need to scrape mud off your shoes. The little ridges in the carpet trap dirt, dust and liquid. The mat edges are serged with matching or contrasting colors. Rubber nibs on the bottom of the mat prevent it from slipping. If you want to increase the elegance quotient of your car, get a pair. Don't forget to check out the nice optional embroidery you can have stitched on these mats. Your personal initials or name embroidered on your car mats gives a certain air of prominence to your car. on your berber car floor mats.